Ao chegar em casa, deu às enteadas o que lhe tinham pedido e entregou à filha um galho de oliveira, árvore que produz azeitonas. Ela correu para junto do túmulo da mãe, enterrou o ramo na terra e chorou tanto que as lágrimas o regaram. Oramo começou a crescer e tornou-se uma bela árvore. Ao baile ?? Tu??? - respondeu ela - Já te olhaste ao espelho? Deixa-me em paz com as tuas lentilhas! Vais ficar em casa e pronto! Ponto final ! E cest fini. pronuncia-se: Cé finí). There was once a rich man whose wife lay sick, and when she felt her end drawing near she called to her only daughter to come near her bed, and said, “Dear child, be pious and good, and God will always take care of you, and I will look down upon you from heaven, and will be with you.” And then she closed her eyes and expired. The maiden went every day to her mother’s grave and wept, and was always pious and good. When the winter came the snow covered the grave with a white covering, and when the sun came in the early spring and melted it away, the man took to himself another wife. The new wife brought two daughters home with her, and they were beautiful and fair in appearance, but at heart were, black and ugly. And then began very evil times for the poor step-daughter. “Is the stupid creature to sit in the same room with us?” said they; “those who eat food must earn it. Out upon her for a kitchen-maid!” They took away her pretty dresses, and put on her an old grey kirtle, and gave her wooden shoes to wear. “Just look now at the proud princess, how she is decked out!” cried they laughing, and then they sent her into the kitchen. There she was obliged to do heavy work from morning to night, get up early in the morning, draw water, make the fires, cook, and wash. Besides that, the sisters did their utmost to torment her, mocking her, and strewing peas and lentils among the ashes, and setting her to pick them up. 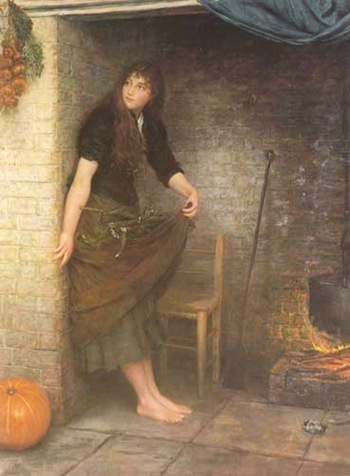 In the evenings, when she was quite tired out with her hard day’s work, she had no bed to lie on, but was obliged to rest on the hearth among the cinders. And as she always looked dusty and dirty, they named her Cinderella. It happened one day that the father went to the fair, and he asked his two step-daughters what he should bring back for them. “Fine clothes!” said one. “Pearls and jewels!” said the other. “But what will you have, Cinderella?” said he. “The first twig, father, that strikes against your hat on the way home; that is what I should like you to bring me.” So he bought for the two step-daughters fine clothes, pearls, and jewels, and on his way back, as he rode through a green lane, a hazel-twig struck against his hat; and he broke it off and carried it home with him. And when he reached home he gave to the step-daughters what they had wished for, and to Cinderella he gave the hazel-twig. She thanked him, and went to her mother’s grave, and planted this twig there, weeping so bitterly that the tears fell upon it and watered it, and it flourished and became a fine tree. Cinderella went to see it three times a day, and wept and prayed, and each time a white bird rose up from the tree, and if she uttered any wish the bird brought her whatever she had wished for. Now if came to pass that the king ordained a festival that should last for three days, and to which all the beautiful young women of that country were bidden, so that the king’s son might choose a bride from among them. When the two stepdaughters heard that they too were bidden to appear, they felt very pleased, and they called Cinderella, and said, “Comb our hair, brush our shoes, and make our buckles fast, we are going to the wedding feast at the king’s castle.” Cinderella, when she heard this, could not help crying, for she too would have liked to go to the dance, and she begged her step-mother to allow her. 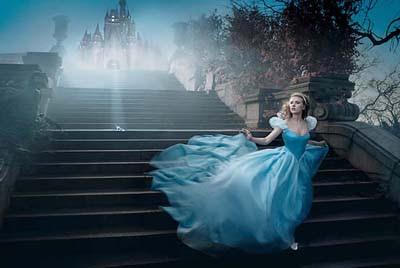 “What, you Cinderella!” said she, “in all your dust and dirt, you want to go to the festival! you that have no dress and no shoes! you want to dance!” But as she persisted in asking, at last the step-mother said, “I have strewed a dish-full of lentils in the ashes, and if you can pick them all up again in two hours you may go with us.” Then the maiden went to the backdoor that led into the garden, and called out, “O gentle doves, O turtle-doves, And all the birds that be, The lentils that in ashes lie Come and pick up for me! Then there came to the kitchen-window two white doves, and after them some turtle-doves, and at last a crowd of all the birds under heaven, chirping and fluttering, and they alighted among the ashes; and the doves nodded with their heads, and began to pick, peck, pick, peck, and then all the others began to pick, peck, pick, peck, and put all the good grains into the dish. Before an hour was over all was done, and they flew away. Then the maiden brought the dish to her step-mother, feeling joyful, and thinking that now she should go to the feast; but the step-mother said, “No, Cinderella, you have no proper clothes, and you do not know how to dance, and you would be laughed at!” And when Cinderella cried for disappointment, she added, “If you can pick two dishes full of lentils out of the ashes, nice and clean, you shall go with us,” thinking to herself, “for that is not possible.” When she had strewed two dishes full of lentils among the ashes the maiden went through the backdoor into the garden, and cried, “O gentle doves, O turtle-doves, And all the birds that be, The lentils that in ashes lie Come and pick up for me! So there came to the kitchen-window two white doves, and then some turtle-doves, and at last a crowd of all the other birds under heaven, chirping and fluttering, and they alighted among the ashes, and the doves nodded with their heads and began to pick, peck, pick, peck, and then all the others began to pick, peck, pick, peck, and put all the good grains into the dish. And before half-an-hour was over it was all done, and they flew away. Then the maiden took the dishes to the stepmother, feeling joyful, and thinking that now she should go with them to the feast; but she said “All this is of no good to you; you cannot come with us, for you have no proper clothes, and cannot dance; you would put us to shame.” Then she turned her back on poor Cinderella, and made haste to set out with her two proud daughters. And when the evening came she wanted to go home, but the prince said he would go with her to take care of her, for he wanted to see where the beautiful maiden lived. But she escaped him, and jumped up into the pigeon-house. Then the prince waited until the father came, and told him the strange maiden had jumped into the pigeon-house. The father thought to himself, “It cannot surely be Cinderella,” and called for axes and hatchets, and had the pigeon-house cut down, but there was no one in it. And when they entered the house there sat Cinderella in her dirty clothes among the cinders, and a little oil-lamp burnt dimly in the chimney; for Cinderella had been very quick, and had jumped out of the pigeon-house again, and had run to the hazel bush; and there she had taken off her beautiful dress and had laid it on the grave, and the bird had carried it away again, and then she had put on her little gray kirtle again, and had sat down in. the kitchen among the cinders. Then the bird cast down a still more splendid dress than on the day before. And when she appeared in it among the guests every one was astonished at her beauty. The prince had been waiting until she came, and he took her hand and danced with her alone. And when any one else came to invite her he said, “She is my partner.” And when the evening came she wanted to go home, and the prince followed her, for he wanted to see to what house she belonged; but she broke away from him, and ran into the garden at the back of the house. There stood a fine large tree, bearing splendid pears; she leapt as lightly as a squirrel among the branches, and the prince did not know what had become of her. So he waited until the father came, and then he told him that the strange maiden had rushed from him, and that he thought she had gone up into the pear-tree. The father thought to himself, “It cannot surely be Cinderella,” and called for an axe, and felled the tree, but there was no one in it. And when they went into the kitchen there sat Cinderella among the cinders, as usual, for she had got down the other side of the tree, and had taken back her beautiful clothes to the bird on the hazel bush, and had put on her old grey kirtle again. “There they go, there they go! And when they had thus cried, they came flying after and perched on Cinderella’s shoulders, one on the right, the other on the left, and so remained. La segunda mujer llevó a casa dos hijas, de rostro bello y blanca tez, pero negras y malvadas de corazón. Vinieron entonces días muy duros para la pobrecita huérfana. “¿Esta estúpida tiene que estar en la sala con nosotras?” decían las recién llegadas. “Si quiere comer pan, que se lo gane. ¡Fuera, a la cocina!” Le quitaron sus hermosos vestidos,le pusieron una blusa vieja y le dieron un par de zuecos para calzado: “¡Mira la orgullosa princesa, qué compuesta!” Y, burlándose de ella, la llevaron a la cocina. Allí tenía que pasar el día entero ocupada en duros trabajos. Se levantaba de madrugada, iba por agua, encendía el fuego, preparaba la comida, lavaba la ropa. Y, por añadidura, sus hermanastras la sometían a todas las mortificaciones imaginables; se burlaban de ella, le esparcían, entre la ceniza, los guisantes y las lentejas, para que tuviera que pasarse horas recogiéndolas. A la noche, rendida como estaba de tanto trabajar, en vez de acostarse en una cama tenía que hacerlo en las cenizas del hogar. Y como por este motivo iba siempre polvorienta y sucia, la llamaban Cenicienta. Un día en que el padre se disponía a ir a la feria, preguntó a sus dos hijastras qué deseaban que les trajese. “Hermosos vestidos,” respondió una de ellas. “Perlas y piedras preciosas,” dijo la otra. “¿Y tú, Cenicienta,” preguntó, “qué quieres?” - “Padre, corta la primera ramita que toque el sombrero, cuando regreses, y traemela.” Compró el hombre para sus hijastras magníficos vestidos, perlas y piedras preciosas; de vuelta, al atravesar un bosquecillo, un brote de avellano le hizo caer el sombrero, y él lo cortó y se lo llevó consigo. Llegado a casa, dio a sus hijastras lo que habían pedido, y a Cenicienta, el brote de avellano. La muchacha le dio las gracias, y se fue con la rama a la tumba de su madre, allí la plantó, regándola con sus lágrimas, y el brote creció, convirtiéndose en un hermoso árbol. Cenicienta iba allí tres veces al día, a llorar y orar, y siempre encontraba un pajarillo blanco posado en una rama; un pajarillo que, cuando la niña le pedía algo, se lo echaba desde arriba. Y enseguida acudieron a la ventana de la cocina dos palomitas blancas y luego las tortolillas, y, finalmente, comparecieron, bulliciosas y presurosas, todas las avecillas del cielo y se posaron en la ceniza. Y las palomitas, bajando las cabecitas, empezaron: pic, pic, pic, pic; y luego todas las demás las imitaron: pic, pic, pic, pic, echando todos los granos buenos en las fuentes. No había transcurrido aún media hora cuando, terminada ya su tarea, emprendieron todas el vuelo. La muchacha llevó las fuentes a su madrastra, pensando que aquella vez le permitiría ir a la fiesta. Pero la mujer le dijo: “Todo es inútil; no vendrás, pues no tienes vestidos ni sabes bailar. Serías nuestra vergüenza.” Y, volviéndole la espalda, partió apresuradamente con sus dos orgullosas hijas. Al anochecer, Cenicienta quiso volver a su casa, y el príncipe le dijo: “Te acompañaré,” deseoso de saber de dónde era la bella muchacha. Pero ella se le escapó, y se encaramó de un salto al palomar. El príncipe aguardó a que llegase su padre, y le dijo que la doncella forastera se había escondido en el palomar. Entonces pensó el viejo: ¿Será la Cenicienta? Y, pidiendo que le trajesen un hacha y un pico, se puso a derribar el palomar. Pero en su interior no había nadie. Y cuando todos llegaron a casa, encontraron a Cenicienta entre la ceniza, cubierta con sus sucias ropas, mientras un candil de aceite ardía en la chimenea; pues la muchacha se había dado buena maña en saltar por detrás del palomar y correr hasta el avellano; allí se quitó sus hermosos vestidos, y los depositó sobre la tumba, donde el pajarillo se encargó de recogerlos. Y enseguida se volvió a la cocina, vestida con su sucia batita. El pajarillo le envió un vestido mucho más espléndido aún que el de la víspera; y al presentarse ella en palacio tan magníficamente ataviada, todos los presentes se pasmaron ante su belleza. El hijo del Rey, que la había estado aguardando, la tomó nmediatamente de la mano y sólo bailó con ella. A las demás que fueron a solicitarlo, les respondía: “Ésta es mi pareja.” Al anochecer, cuando la muchacha quiso retirarse, el príncipe la siguió, para ver a qué casa se dirigía; pero ella desapareció de un brinco en el jardín de detrás de la suya. Crecía en él un grande y hermoso peral, del que colgaban peras magníficas. Se subió ella a la copa con la ligereza de una ardilla, saltando entre las ramas, y el príncipe la perdió de vista. El joven aguardó la llegada del padre, y le dijo: “La joven forastera se me ha escapado; creo que se subió al peral.” Pensó el padre: ¿Será la Cenicienta? Y, tomando un hacha, derribó el árbol, pero nadie apareció en la copa. Y cuando entraron en la cocina, allí estaba Cenicienta entre las cenizas, como tenía por costumbre, pues había saltado al suelo por el lado opuesto del árbol, y, después de devolver los hermosos vestidos al pájaro del avellano, volvió a ponerse su batita gris.